Known as the patron saint of Scotland, Romania, Greece, and many more European countries, Saint Andrew was an apostle who not only introduced his brother, Peter, to Jesus, but also helped Scottish King Oengus I win a crucial battle against Northumberland, securing Scotland’s safety. Saint Andrew died a martyr and was crucified on a saltire, or an “X” shaped cross, in Greece in 60 AD. That’s why Saint Andrew’s Day, celebrated on November 30 each year, is considered a national holiday in Scotland and across Europe. Scotland and Northern Ireland recognized Saint Andrew's Day as a bank holiday, giving all Scots the opportunity to celebrate in full force. Although Saint Andrew was revered in Scotland from around 1000 AD, he was not made an official patron saint until the signing of Declaration of Arbroath. As an apostle of Jesus Christ, Saint Andrew met a similar fate and was crucified in Greece in 60 AD on a saltire, or a 'X' shaped cross. Gather your friends and feast on haggis, porridge, black pudding (ok, maybe leave that one out), and whiskey! While you're at it, create some fun trivia about Saint Andrew himself. Did you know he was a fisherman as well? While it may not be a national holiday in America, we all can be Scots at heart. To celebrate Saint Andrew's Day, wear a kilt, paint your face with a traditional blue saltire (better known as Scotland's flag), and call it a day! If you're like us, then you're ready to book a one-way ticket to Scotland after learning how much fun it is to celebrate Saint Andrew's Day. From November 30 to December 3, you can find the Scots celebrating across Europe, but it gets no better than in the town of St Andrews itself, thanks to rolling landscapes, history, and tradition. In Romania it is tradition for young women to place 41 grains underneath their pillow, and if they dream their grains are stolen, then it's believed they will find a husband within the year. In Poland husbandless women believe they are able to predict their future husband's occupation by pouring hot wax through a keyhole into water — the wax forming to resemble the shape of their occupation. In Slovakia young women write down the names of potential husbands on pieces of paper, kneading them into dough and baking; the first name to rise to the top of the bread will be their husband. In Moldova young men steal and hide gates or doors from the homes of the young women they wish to marry. In the morning the fathers' are tasked with finding their gates, thus knowing their daughter has a suitor. In Austria young women throw a shoe over their shoulder; if it lands pointing towards the door they will be married within the year. In Scotland and across Europe, people celebrate Saint Andrew's Day by feasting! May we suggest whipping up a meal of traditional haggis, neeps, and tatties (turnips and potatoes), and topping it off with a glass of Scottish whiskey — straight? Do we really need a reason to wear a kilt? No. Do we want a reason to wear a kilt? Absolutely. To celebrate, grab yourself a traditional Scottish kilt and never look back! If it's one thing the Scots know how to do, it's drink! 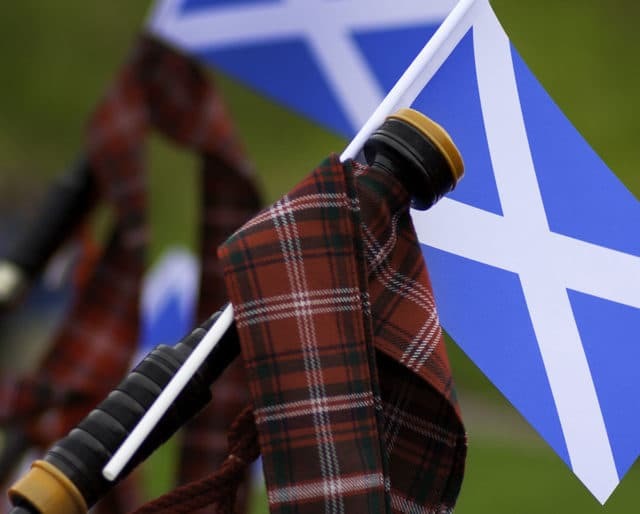 Since Saint Andrew's Day is considered Scotland's national holiday, they go all out with weeklong festivals, parties, and more. You can find a glass of whiskey or beer in just about anybody's hand during the celebrations!